I was a bit confused the first time I went to Disney World. I’d been to Disneyland in California many times before, but there were so many differences that I wasn’t quite sure what to expect. For example, how the heck was I suppose to use these cool MagicBands that I received? Luckily I figured it out pretty quickly, and have since come to really love using them in place of tickets and such. There’s so many ways they make your trip better, and we’re sharing all our tips with you. So read on to learn all about the Disney MagicBands: Why They’re Amazing! First of all, make sure your keep your MagicBand SAFE, because this is your ticket and key for many things! There are clasp slider things you can get, like a BitBelt, that help secure your band on just in case. This can be especially helpful for little kids who not only have tiny wrists, but also move around and mess with their bands a lot. Here’s why they’re so important, and why I absolutely love them on my Disney trip! And don’t forget to check out Get Away Today for the best prices on your magical vacation! If you’re staying at a Disney-owned hotel, you can use the Magical Express shuttle from the airport to/from your hotel – for FREE! When you get to the airport, you check in at the Magical Express area (there’s plenty of signs all around the airport, don’t worry) – if you have a MagicBand, you just scan it and your reservation for the hotel pops up nice and easy. Otherwise you have to pull out your documents showing your reservation, taking more time and hassle. I’m a big fan of online check-in, because the lines when you arrive at your resort are typically pretty long (especially if you took the shuttle, because a LOT of people are arriving with you!). Checking in online beforehand is a great way to just skip straight to the fun – and they’ll email/text you when your room is ready, with the room number and location, so you can just go there at your convenience. What about a key? Your MagicBand is your hotel room key – yay! That means you don’t even have to go to the front desk to pick up any keys. Unlike Disneyland, they do the FastPass+ system without tickets – this means it’s tied to your MagicBand! When it’s time for one of your FastPasses, you go up to that line and scan your band at the little Mickey stands. It’ll turn green if you’re good to go, and that’s it. No more keeping track of tiny paper tickets, thank goodness. And for your dining reservations, those can be pulled up by scanning your band, as well. To get in and out of the park, you can just scan your band at the Mickey stands, check your fingerprint (made the first time you go), then walk on in! It’s so nice to not have to have your tickets out and handy as you’re already trying to get through the lines, security and everything. Check out Get Away Today for awesome prices on your Disney trip! You know those amazing photographers all over the parks willing to take your photos? They just scan it onto your MagicBand, then the photos are loaded to your account to view and/or purchase. So convenient! Plus, during rides that have photos – they’re automatically scanned to your band, so you don’t have to rush at the end to nab your photo before it switches to the next one. If you do breakfast or lunch at the Be Our Guest restaurant (highly recommend it – so fun! ), you seat yourself after placing your order. With your Magicband, they can find you to bring you food right to your table. Don’t worry though – if you don’t have a band they give you a special ‘rose’ so they can still locate your party. For this amazing ride in Epcot, you design a ‘test’ vehicle for a simulation ride while in line (or at a station after the end of the ride), then scan your design from your MagicBand right before you get into your ‘car’. This is really exciting for kids (heck, and us adults, too!) who want to see how their design does. Also, a cast member told me it stays on your MagicBand for about 30 days – so if you design the perfect one and don’t want to replace it when you return in a few days or so, just be sure to not scan a new one onto your band and your cool design will still be there. Our friends at Michael’s VIPs can give you all sorts of fun tips with their unforgettable guide services! Since they can ping/locate your MagicBand, some ques or rides will have special messages with YOUR NAME on there! At the end of it’s a small world, it said goodbye to ‘Danielle & Vardee’ when I went with my mom a couple years ago. Last year with hubby in line for Expedition Everest, one of those screen ‘ads’ that scroll through personalized to ‘Clayton’, and we saw a few kids get excited when their name popped up in others as well. 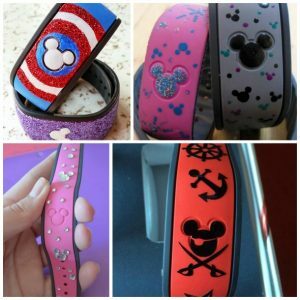 Whether you want to add fun things to it yourself, like little button stick-ins or glitter, or want to order a printed design, you can have a lot of fun designing your own MagicBand. Since you don’t HAVE to get a new one each visit, but instead can keep your favorite band, it makes it like a special keepsake as well. If you don’t want to pay more for customizing or decorating it, no worries – if you’re staying at a Disney-owned hotel they send each person one for free and have a handful or so of colors you can choose from. And yes, you can still put your name or something on it while you’re doing the personalizing, too! What color or design would you want your MagicBand? With all of these snow storms & freezing weather, kids aren’t getting as much outside time. 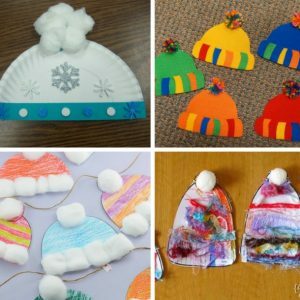 If yoy’re looking for a fun winter-themed craft to give them a little extra fun this winter, you’ll love these winter 12 Winter Hat Kid Crafts! They’re an excellent craft to make during the winter, and your kids will love them! Let this sink in for a moment – it’s less than a month until Valentine’s Day. Please tell me I’m not the only one in shock – I mean, didn’t it just turn 2018, and already we’re looking to February?! Well, whether we’re ready or not, the holiday is coming – so to TRY and get myself in the festive pink-and-red-everything mood, I wanted to share this fun DIY Valentine Frame from Craft Sticks that I put together. It’s surprisingly easy, aside from getting the glitter off your hands afterwards (really, I need to find a reliable trick that will help me get rid of the random glitter that sticks around for days after a project because DANG it’s everywhere). 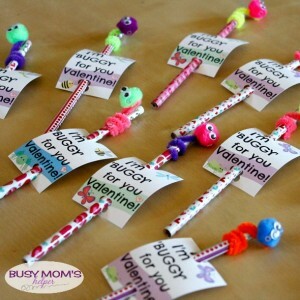 You don’t even need a ton of stuff, and you can even let the kids make their own sweet valentine frame for a neat holiday craft. I love that it’s 3-D looking due to the layer and stacking of the sticks, and that you can customize it to fit your own preferences. Hate pink? Don’t use it. Want larger sparkles instead of tiny glitter? Do it. This is YOUR Valentine frame, so make it your own! If you haven’t already, cut the 6 craft sticks into halves (does NOT have to be perfect, just ‘ish’). Then, pour your glitter/sparkles of choice into a large plate or tray. I mixed a few colors to get a variety mix (silver, white, pink and purple). Rub one side of each stick (including the halves) with your glue stick – one stick at a time – then rub in the glitter mixture to coat that side. Set aside to dry as you continue with all the sticks. Follow the following diagram below to arrange and hot glue your sticks together. 1: put 2 sticks on the left and 2 sticks on the right, connecting at the bottom point of the ‘heart’ (don’t glue in this step). 2: glue a stick on top & between the two sticks on each side (shown in photo 2 and 3 below). 3: glue 2 halves on the top right and 2 halves on the top left to angle in towards the top of the ‘heart’. 4: Turn over and glue 2 halves under the left and 2 halves under the right to do the final point down and in to finish the ‘heart’ shape. 5: Turn it back over and glue 1 half on the left and 1 half on the right to make the top center part more sturdy. 6: Glue 1 half to the left and 1 half to the right for the top ‘corner edge’ parts of the heart – again, to make it sturdy. To finish it up, glue a ‘handle’ to the back & bottom of your heart shape with the last full craft stick piece! Then all you have left is to carefully trace & cut out your photo so it fits on the back of your frame, then carefully glue along the edges so it stays in place. That’s it! I know that may seem like a lot of steps, but it’s truly simple and takes hardly any time at all. In fact, doing the glitter on the sticks is what took me the longest of everything! Just be sure to follow that diagram photo so you have a visual to help keep it as easy as possible. I had to add the photo hubby and I had taken during family pictures last month because I absolutely LOVE it! Often us moms forget to get photos of us with our kids, and sometimes even less do we get photos with our honey. That’s something I’m trying to work on this year – more photos WITH those I love, not just of them! One last tip – if you don’t want the ‘craft stick’ tan color showing through, you can use markers or paint before hand to color it, or just be sure to layer up the glitter a lot for full coverage. I kind of like the randomness and dimension to it, but that’s just my personal preference. 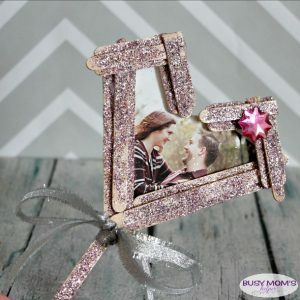 What photo would YOU put in this fun DIY Valentine frame? 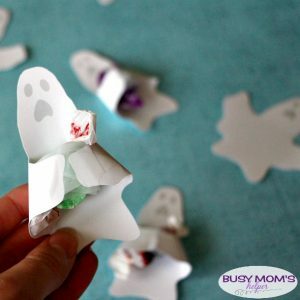 Whether you’re doing a themed project at preschool, need to give the kids an activity while you tackle laundry, or just want to sit down together and create, here’s a fun list of 21 Alien and Monster Crafts for Kids to help you out. 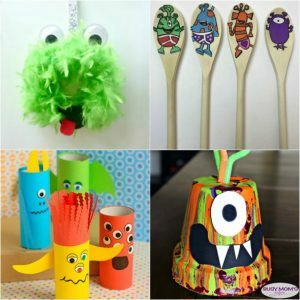 Which of these alien and monster crafts for kids would YOUR kid like to do first? Why oh why do I let Christmas sneak up on me every single year? I thought I was *super* on the ball this year, having all the kids’ gifts done and wrapped shortly after Thanksgiving – but I completely forgot all their teachers! Between my five kiddos, we have 8 main school teachers (some switch half-day, so have two main teachers), plus several assistants, six dance instructors and four karate professors. Instead of blasting holiday music and curling up with some hot chocolate trying to ignore the fact I hadn’t gotten them gifts, I got creative. It’s super easy to customize cheap, plain stockings to make the perfect Teacher Gift Idea – a Survival Kit to help get them through the rest of the year! Hover on the image below for some super easy shopping for the fun BAND-AID® Brand Adhesive Bandages holiday collection online! Since I was extremely scrunched on time, and determined to tackle this last ‘big’ task I had before really relaxing for the holiday, I swung by Target to get everything I needed to create these fun teacher stocking gifts. While you should definitely get some fun items to stick in their stocking – like a gift card, cute mug, fun note pad or candies – be sure to stock up on stuff that are much-needed in classrooms. There’s several things that work for ANY type of teacher – be it school, dance, karate or whatever – such as packs of BAND-AID® Brand Adhesive Bandages. And guess what? Their festive BAND-AID® Brand Adhesive Bandages holiday collection is on sale in the ads during the week of 12/17! You can nab 2 for just $5, making them a very useful (aka necessary) classroom item for a great price. Since kids have a tendency to get hurt even in the strangest of ways, any parent, teacher or instructor is smart to have BAND-AID® Brand Adhesive Bandages on-hand because they heal hurts faster and are the #1 doctor recommended brand. Target also has Paw Patrol and Star Wars BAND-AID® Brand Adhesive Bandages, which make for great stocking stuffers for the kids, so why not grab a few of those while you’re there? Crayons, Markers, Pencils, Pens, etc. Target gift card – to buy whatever else they may be needing! Don’t forget the stuff that’s just for fun, as well! Use hot glue to attach a ribbon or strand of beads to create a line accent, – this can work at the top, around the bottom of the ‘cuff’ of the stocking, or even all around the edges of the stocking part. I did two as a strip at the top, then cut some bead strands to ‘dangle’. Before glueing, decide on a pattern/style you want for the stocking by laying out your accent pieces/decor. Once you’ve found the spots/pattern you want, carefully hot glue them in place. Once dry, rub a little where there’s excess hot glue sticking out to help remove those loose ‘glue strings’ that sometimes occur. Fill with teacher gift items- the fun AND the useful – and BAND-AID® Brand Adhesive Bandages. See, it’s really easy to turn a simple, plain stocking into a personalized and fun gift packaging! You can even have your kids help pick out the decorations and design the gift, making it extra special. Just be sure to watch them with the hot glue, please! If you have room in the stocking, you can even have your child write a few thoughtful notes or memories to stick in there as a special surprise that is sure to mean a lot to their teacher. I even put in a few from me, since I’m sure they don’t hear gratitude from the parents often enough. What other teacher survival kit items would YOU include? 10 Pokemon Crafts: You’ll Want to Try Them All! How long do your kids get out of school for the holiday break this year? Mine have half-day Wednesday, then don’t go back until January 9th – almost THREE WEEKS! 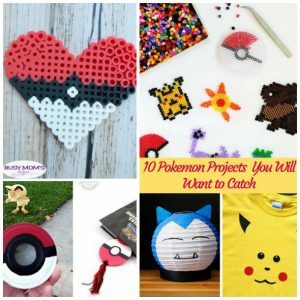 Needless to say, we’ll be doing quite a few fun activities and projects while they’re home, both for quality time together AND to keep them from driving me bonkers 🙂 Since my boys are really big into Pokemon, I thought it’d be fun to share these 10 Pokemon Crafts: You’ll Want to Try Them All! I never did get into the whole Pokemon craze – not even Pokemon Go (gasp! ), but that hasn’t stopped my boys from loving the it! 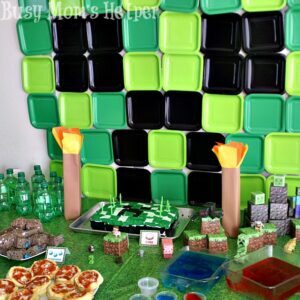 This list has a bit of everything, from perler bead projects to clothing and mugs – even some keychains and bookmarks! I know my Iron Man will certainly be making a few of those bookmarks to stick in the novels he keeps flying through – so glad! What’s YOUR kids favorite Pokemon? Do you go all out for Thanksgiving when you host? I sure would love to – an elegant spread, name cards and centerpieces and the whole lot. The reality is that I simply can’t – between time, money and the 5 kids ‘helping’ with setting everything up, we’ve got to keep it simple. 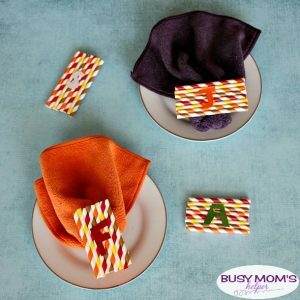 One idea is to get them involved and just have fun with it – like making these DIY Thanksgiving Place Settings! They’re super simple and quick, and even though they aren’t the ‘fanciest’, they’re still plenty colorful and entertaining for any holiday table. Y’all know I’m a big fan of crafts that can be done using scraps, right? Well all this takes is scraps of straws, Popsicle sticks, paper and hot glue – easy-peasy! It’s even better if you have a variety of Thanksgiving colors, like reds, yellows, oranges, browns and golds. Just think of all those pretty fall shades! You can totally customize these to be whatever size or shape you’d like, and get as creative with the letter (or full name, if you feel ambitious) as you’d like. I considered sparkles, but then realized we’d all end up with sparkles in our food so dismissed that pretty quickly. Add a cute, colored feather in the top corner, or a mini turkey sticker. Have fun with it, especially if your kids are helping you put them together (and be careful with that hot glue!). Cut the straws to the size you’d like. We just did them in half. Cut the popsicle sticks so they fit behind your final shape, holding it together but not sticking out the sides. When you have the straws laid out however you’d like (I tried to line up the stripes so it looked like a continuous, multi-colored pattern), add some hot glue on the back and carefully place your popsicle stick on it. Try to make it go all the way across the straws, so it’ll hold them all together. Cross them, or just line them up next to each other – the main point is that they are there to secure all the straws in place. Cut out (or use stickers) for the letters or names to go on each of the place settings – glue or stick them on. That’s it – super simple, and you can get as creative as you’d like! Just place on your each plate/napkin for some colorful Thanksgiving place settings for everyone to enjoy. I’ve seen a lot of things lately that are galaxy themed. Parties, decorations, and everything. I agree it’s a fun trend & I like the look of it! If you or your kiddos are fans as well, you’re going to love this list of 20 DIY Galaxy Projects! Personally, I really want to try those awesome-looking fingernails. Oooh, don’t those diy galaxy bath bombs look cool, too? 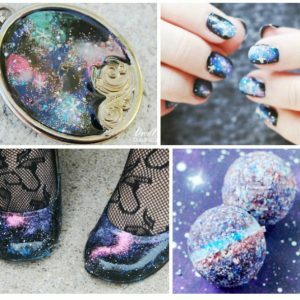 There’s just so many fun galaxy projects to try, I need like a whole day devoted to trying all of these fun things!